[S577] California Death Records, online http://www.rootsweb.com/rootsweb/graphics/ca.html, viewed on 6 Apr 2001 (stating that his mother's maiden name was Keith). [S312] Social Security Death Index, online at http://tinyurl.com/AncestrySSDI, viewed on 6 Apr 2001 (stating that he was born on 13 Aug 1913 and not naming the place). [S604] Tammy Van Horn, computer files sent to Roger Bartlett, 19 Feb 2001 (giving only the year and not naming the place). [S577] California Death Records, online http://www.rootsweb.com/rootsweb/graphics/ca.html, viewed on 6 Apr 2001 (stating that he was born on 8 Aug 1913 in Texas). [S312] Social Security Death Index, online at http://tinyurl.com/AncestrySSDI, viewed on 6 Apr 2001 (stating that he died in Jul 1982; not naming the place of death but stating that he lived in San Martin, Calif. when he died). [S577] California Death Records, online http://www.rootsweb.com/rootsweb/graphics/ca.html, viewed on 6 Apr 2001. [S604] Tammy Van Horn, computer files sent to Roger Bartlett, 19 Feb 2001 (giving only the year). [S604] Tammy Van Horn, computer files sent to Roger Bartlett, 19 Feb 2001 (naming Thomas Roy Estes as her father). [S604] Tammy Van Horn, computer files sent to Roger Bartlett, 19 Feb 2001 (naming Lillie Grace Brawley as her mother). [S604] Tammy Van Horn, computer files sent to Roger Bartlett, 19 Feb 2001. [S1108] Social Security Death Index, online at http://tinyurl.com/RootswebSSDI, viewed on 4 Feb 2007. [S1108] Social Security Death Index, online at http://tinyurl.com/RootswebSSDI, viewed on 4 Feb 2007 (stating that he died on 7 Nov 2004; not naming the place of death but stating that he lived in Mason, Tex. when he died). [S604] Tammy Van Horn, computer files sent to Roger Bartlett, 19 Feb 2001 (naming James Levi Brawley as her father). [S1036] Leta Brawley McCurry, electronic mail to Roger Bartlett, 15 Aug 2005, (naming James Levi Brawley as her father). [S604] Tammy Van Horn, computer files sent to Roger Bartlett, 19 Feb 2001 (naming Bertha Minerva Estes as her mother). [S1036] Leta Brawley McCurry, electronic mail to Roger Bartlett, 15 Aug 2005, (naming Bertha Miranda Estes as her mother). [S1036] Leta Brawley McCurry, electronic mail to Roger Bartlett, 15 Aug 2005. [S604] Tammy Van Horn, computer files sent to Roger Bartlett, 19 Feb 2001 (naming James Levi Brawley as his father). [S1036] Leta Brawley McCurry, electronic mail to Roger Bartlett, 15 Aug 2005, (naming James Levi Brawley as his father). [S1069] Fort Worth Star-Telegram, Fort Worth, Tex., 17 Sep 2003, p. 8B (obituary of Earl Ray Brawley) (naming James Brawley as his father). [S604] Tammy Van Horn, computer files sent to Roger Bartlett, 19 Feb 2001 (naming Bertha Minerva Estes as his mother). [S1036] Leta Brawley McCurry, electronic mail to Roger Bartlett, 15 Aug 2005, (naming Bertha Miranda Estes as his mother). [S1069] Fort Worth Star-Telegram, Fort Worth, Tex., 17 Sep 2003, p. 8B (obituary of Earl Ray Brawley) (naming Bertha Estes Brawley as his mother). [S1036] Leta Brawley McCurry, electronic mail to Roger Bartlett, 15 Aug 2005, (giving the date but not the place). [S312] Social Security Death Index, online at http://tinyurl.com/AncestrySSDI, viewed on 30 Apr 2006 (giving the date but not the place). [S1069] Fort Worth Star-Telegram, Fort Worth, Tex., 17 Sep 2003, p. 8B (obituary of Earl Ray Brawley). [S1036] Leta Brawley McCurry, electronic mail to Roger Bartlett, 15 Aug 2005, (giving her name as Mertie Thomas). [S312] Social Security Death Index, online at http://tinyurl.com/AncestrySSDI, viewed on 30 Apr 2006 (stating that he died on 15 Sep 2003; not naming the place of death but stating that he lived in Azle, Texas when he died). [S1036] Leta Brawley McCurry, electronic mail to Roger Bartlett, 15 Aug 2005, (stating that he died in Tarrant County, Texas but giving 15 Feb 2003 as the date). [S1069] Fort Worth Star-Telegram, Fort Worth, Tex., 17 Sep 2003, p. 8B (obituary of Earl Ray Brawley) (stating that he died on 15 Sep 2003 and indicating he died in Azle, Texas). [S1036] Leta Brawley McCurry, electronic mail to Roger Bartlett, 15 Aug 2005, (stating that he was born about 1915). [S1036] Leta Brawley McCurry, electronic mail to Roger Bartlett, 15 Aug 2005, (stating that he was born about 1915 and died very young). [S1036] Leta Brawley McCurry, electronic mail to Roger Bartlett, 15 Aug 2005, (giving his name as Alton Ivy Brawley and naming James Levi Brawley as his father). [S1036] Leta Brawley McCurry, electronic mail to Roger Bartlett, 15 Aug 2005, (giving his name as Alton Ivy Brawley and naming Bertha Miranda Estes as his mother). [S312] Social Security Death Index, online at http://tinyurl.com/AncestrySSDI, viewed on 6 Apr 2001 (giving the date but not the place). [S1036] Leta Brawley McCurry, electronic mail to Roger Bartlett, 15 Aug 2005, (giving his name as Alton Ivy Brawley and stating that he was born in Marietta, Oklahoma but giving 20 Mar 1921 as his birth date). [S312] Social Security Death Index, online at http://tinyurl.com/AncestrySSDI, viewed on 6 Apr 2001 (not naming the place of death but stating that he lived in Medina, Tex. when he died). [S579] Texas Death Records, online http://vitals.rootsweb.com/tx/death/search.cgi, viewed on 6 Apr 2001. [S1036] Leta Brawley McCurry, electronic mail to Roger Bartlett, 15 Aug 2005, (giving his name as Alton Ivy Brawley). [S1036] Leta Brawley McCurry, electronic mail to Roger Bartlett, 15 Aug 2005, (giving their names as Alton Ivy Brawley and Gean Swindell). [S577] California Death Records, online http://www.rootsweb.com/rootsweb/graphics/ca.html, viewed on 28 Oct 2001 (stating that her father's surname was Worth). [S577] California Death Records, online http://www.rootsweb.com/rootsweb/graphics/ca.html, viewed on 28 Oct 2001 (stating that her mother's original surname was Jones). [S577] California Death Records, online http://www.rootsweb.com/rootsweb/graphics/ca.html, viewed on 28 Oct 2001. [S312] Social Security Death Index, online at http://tinyurl.com/AncestrySSDI, viewed on 28 Oct 2001 (giving only the date). [S312] Social Security Death Index, online at http://tinyurl.com/AncestrySSDI, viewed on 28 Oct 2001 (not naming the place of death but stating that she lived in Modesto, Calif. when she died). [S604] Tammy Van Horn, computer files sent to Roger Bartlett, 19 Feb 2001 (naming George Dewey Estes as his father). [S604] Tammy Van Horn, computer files sent to Roger Bartlett, 19 Feb 2001 (naming Laura Inez Sowell as his mother). Marriage*: She married _____ Selph. Marriage*: He married _____ Keith. Marriage*: He married Lucy Baxter. [S616] e-mail address, electronic mail to Roger Bartlett, 6 Apr 2001, (naming Archibald Holland as his father). Marriage*: She married Archibald Holland. [S616] e-mail address, electronic mail to Roger Bartlett, 6 Apr 2001, (naming Lucy Baxter as his mother). ERECTED MANY OF THE LARGEST STRUCTURES IN DALLAS. Came to This City in 1873 and Was Identified with Its Early Development. After an illness of six months, Daniel Morgan, a pioneer citizen of Dallas, passed away at his home, 806 North Harwood street, yesterday evening. Funeral services will be held at the house at 2:30 o’clock tomorrow afternoon. Burial will be in the family lot in Greenwood Cemetery. The service will be conducted by Rev. William M. Anderson, pastor of the First Presbyterian Church, and Rev. New Harris, pastor of Trinity Methodist Church. Daniel Morgan was born in Fifeshire, Scotland, Jan. 15, 1839. He attended the local public schools until he was 18 years of age, when he came to the United States and located in New York City. At the close of the Civil War he removed to Alabama, where he became a railroad contractor. In 1866 he married Miss Eliza Burney of Chambers County, Ala. Came to Dallas in 1873. In 1873 he located in Dallas, where he took up the line of building contractor, and he has left many monuments of his skill. He built the Dallas County courthouse, The News Building, the Belo residence, on Ross avenue; St. Mary’s College, the Juanita Building and many other structures, besides one or more of the public buildings in many of the larger towns of North and Central Texas were erected by him. He had the contract for the bridge work on the Denver and South Park Railroad, including the Alpine tunnel, in Colorado, where he was engaged from 1877 to 1882. Mr. Morgan was one of the original promoters of Trinity River navigation, and he contributed liberally of his money toward that enterprise. He firmly believed the river could be made navigable, and he often expressed a wish that he might live to see that belief realized. Mr. Morgan was one of the actual builders of Dallas. Besides the many handsome buildings which he erected, he was liberal in his contributions to all public enterprises. The books of the State Fair will show that he many times gave his check to help that institution when it got into straits. While Mr. Morgan was a conspicuous figure in Dallas for almost forty years, he studiously kept out of the limelight, but those who had opportunities to know him intimately are unanimously agreed that no man could have a more steadfast friend than this Scotchman. He was a member of Dallas Lodge No. 70, Knights of Pythias. His widow and seven children survive him. The children are Misses Annie and Lucile Morgan, Daniel Morgan, Jr., Mrs. Matt M. Toole, Mrs. Paul A. Johnston, Mrs. Carroll M. Selby and James R. Morgan, all of whom were at his bedside when he passed away. Mr. Morgan contracted la grippe on Dallas Day at the State Fair last year. From that date his health rapidly failed. On Tuesday of last week he had a stroke of apoplexy, after which he did not regain consciousness. [S67] The Dallas Morning News, Dallas, Tex., 12 Apr 1911, p. 5 (obituary of Daniel Morgan). [S67] The Dallas Morning News, Dallas, Tex., 12 Apr 1911, p. 5 (obituary of Daniel Morgan) (giving her name as Eliza). [S67] The Dallas Morning News, Dallas, Tex., 12 Apr 1911, p. 5. [S1171] Peggy Morgan, charts and information sent to Roger Bartlett, 15 Oct 1992. [S617] Rick Campbell, electronic mail to Roger Bartlett, 16 Apr 2001, (naming Daniel Morgan as his father). [S67] The Dallas Morning News, Dallas, Tex., 25 Dec 1928, pt. 2, p. 11 (obituary of Mrs. Eliza Caroline Morgan) (not giving the date but stating that she was eighty years old when she died on 24 Dec 1928). [S67] The Dallas Morning News, Dallas, Tex., 25 Dec 1928, pt. 2, p. 11 (obituary of Mrs. Eliza Caroline Morgan). [S617] Rick Campbell, electronic mail to Roger Bartlett, 16 Apr 2001, (naming Elizabeth Caroline Burney as his mother). Ruby Lela Keith, courtesy of Melissa Baker. [S619] Carrolyn Clark, electronic mail to Roger Bartlett, 30 May 2001, (naming Elmer Oren Keith as her father). [S619] Carrolyn Clark, electronic mail to Roger Bartlett, 30 May 2001, (naming Della May Estes as her mother). [S619] Carrolyn Clark, electronic mail to Roger Bartlett, 30 May 2001. [S619] Carrolyn Clark, electronic mail to Roger Bartlett, 30 May 2001, (giving only the place). [S717] Melissa Baker, electronic mail to Roger Bartlett, 31 Dec 2001, (giving only the date). [S718] Melissa Loney's Family Tree, online, above, (naming Ruby Lela Keith as his mother). [S718] Melissa Loney's Family Tree, online, above, (naming Ruby Lela Keith as her mother). 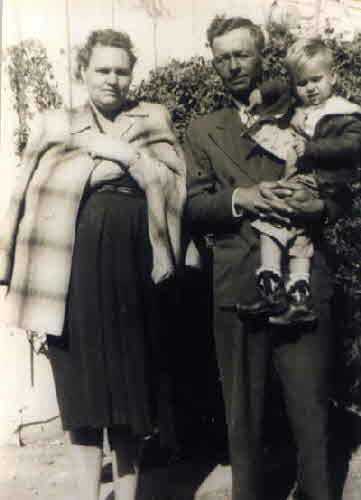 Ruby Lela Keith and Silas Otha ("Buster") Baker with a son, courtesy of Melissa Baker. [S717] Melissa Baker, electronic mail to Roger Bartlett, 31 Dec 2001. [S718] Melissa Loney's Family Tree, online, above, (naming Buster Baker as his father). [S718] Melissa Loney's Family Tree, online, above, (naming Buster Baker as her father). Marriage*: He married Susanna Masters. [S620] Doris Burkhamer, e-mail address, chart of descendants of Isaac Duffer sent to Roger Bartlett, 23 May 2001,(naming Johnathon Bicknell as her father). Marriage*: She married Johnathon Bicknell. [S620] Doris Burkhamer, e-mail address, chart of descendants of Isaac Duffer sent to Roger Bartlett, 23 May 2001,(naming Susanna Masters as her mother).